On April 5, 2013, members of the Allen Camp set up a Confederate History Month display at the Bluebonnet Library in Baton Rouge. The display can be viewed there for the entire month of April, 2013. This Confederate static display is normally set up in April of each year for Confederate History Month. The display was set up by Camp Commander Randy Jarreau, Colour Sergeant Buck Tucker, and Sergeant-At-Arms James Cannon. On June 23, 2012, the Henry Watkins Allen Camp held a dedication ceremony at Cottonwood Cemetery near Lottie, LA. The ceremony, which featured reenactors from the 10th Brigade Louisiana State Militia and the 5th Company Washington Artillery, was put on to honor the dedication of two recently placed Confederate gravestones. These memorial gravestones were issued by the U.S. Veterans Administration. The gravestones are placed in memorial of General Robert Plunket Maclay of the Army of Trans-Mississippi, and his nephew, Corporal Charles Allen of the 5th Company Washington Artillery. On February 29, 2012, Allen Camp Commander Randy Jarreau and Colour Sergeant Buck Tucker set up a Confederate Heritage display at the Bluebonnet Library in Baton Rouge. The display can be viewed there for nearly the entire month of March, 2012. This Confederate static display is normally set up in April for Confederate History Month, but had to be moved up a month this year due to other commitments at the library. The display is tentatively scheduled to be moved to the downtown library in April for Confederate History Month. On the afternoon of Sunday November 6, 2011, the City of Port Allen, Louisiana (located on the west bank of the Mississippi River, opposite of Baton Rouge), held their annual West Baton Rouge Parish Veterans Parade. A U.S. Marine Corps color guard, various active military units, high school JROTC squads, law enforcement units, and a bagpipes and drum corps led a procession through the streets of downtown Port Allen. The parade followed a 1.6 mile route from the city's Rivault Baseball Park to the West Baton Rouge Parish Courthouse. Included in the procession were a number of convertibles, featuring beauty queens and veterans. Also included were floats, and decorated trucks and trailers, carrying U.S. veterans from W.B.R. and neighboring parishes, as well as a number of dignitaries, local celebrities, and patriotic people of every walk of life. Included among those participating (for the second consecutive year) was a Confederate unit, sponsored by the Henry Watkins Allen Camp 133, Sons of Confederate Veterans, of Baton Rouge, LA. Following a lead-in from the massive guns of the U.S.S. Kidd from its mooring across the Mississippi River, and an overhead pass by two fighter jets, an eleven man Confederate re-enactor color guard opened the festivities with rifle fire, followed by artillery fire from a two man gun crew of the Fifth Company, Washington Artillery re-enactors. Just as last year, the Louisiana Lt. Governor, Jay Dardenne, eagerly accepted the invitation to fire the cannon. With that, the parade began, with the procession marching past the Confederate re-enactors lined up at attention on the east side of the street. The First National and Second National Confederate Flags were waving proudly in the breeze. About mid-way of the procession, the Confederate Color Guard fell in behind the Allen Camp's float. There were fifteen riders on the entry, followed by two females in period dress, many throwing candy, beads and SCV recruiting coins. The Confederate Color Guard also handed out recruiting coins when appropriate, and fired a number of times during the march, including once to honor those veterans gathered in front of the Parish Museum. The parade ended at the West Baton Rouge Parish Courthouse (the front of which was covered by a giant United States flag). The re-enactors (portraying Colonel Allen's 4th LA Infantry of W.B.R. Parish) marched to the Henry Watkins Allen statue in the small park across from the courthouse, held a short ceremony in which the City and Camp 133's namesake was remembered by Commander Jarreau, before a final rifle salute was fired in his honor. Again the Confederate contingent was welcomed with open arms and words of praise. It is hoped that we will be able to continue our participation in next year's parade. Members of the Henry Watkins Allen Camp participated in the 16th Annual Port Allen Sugar Festival on October 2, 2011. The group included camp members Dustan Milam, David Villere, James Cannon, and Randy Jarreau. A Civil War soldier's camp display was set up as part of a living history presentation. The reenactors were drilled in troop movements by Charles Tucker of Brandon, MS. In addition to the troops marching, the crowd was treated to several volleys fired from the group's black powder muzzleloaders. Members of the Allen Camp participated in a WBTS Sesquicentennial event on April 2, 2011 at the Randall Oak Historical Marker re-dedication. The event was held on the grounds of the old Poydras College on the banks of False River in Pointe Coupee Parish, just south of New Roads, Louisiana. The Randall Oak marker is in front of the Randall Oak tree on the grounds of the college. The tree is named in honor of James Ryder Randall, who wrote the poem "Maryland, My Maryland". This poem was put to music and became an inspirational piece for Southern troops during the war. The song later became, and still is, the state song of Maryland. Randall wrote the poem while he was an English professor at Poydras College. Being a native Marylander, he was inspired to write the piece upon learn of the massacre of civilians by Union troops in the streets of Baltimore. These troops had been sent to, and did, place the entire legislature of the State of Maryland under arrest to prevent that body from enacting an Ordinance of Secession for Maryland. The original Randall Oak marker was placed by the Pointe Coupee Book Club in 1938. This April 2 event featured an unveiling by members of the Book Club, a musket salute by the Louisiana State Militia-10th Brigade reenacting group, bagpipes by the Baton Rouge Bagpipe and Drum Corps., artillery salutes by the Washington Artillery and Pelican Battery reenacting groups, as well as speeches and presentations by local dignitaries. An old Poydras College artifact was presented and donated to the Pointe Coupee Historical Society. A living relative of James Ryder Randall, David Randall, was present as an honored guest at the event. The Confederate statue near North Boulevard and Third Street was removed from its pedestal on February 8, 2011. The statue, which was erected in 1890 in remembrance of the Confederate soldiers of East and West baton Rouge Parishes, is eventually supposed to be placed on the grounds of the nearby Louisiana Old State Capitol. The statue's original position at the intersection of North and Third is to be redesigned as part of an initiative by the Baton Rouge Downtown Development District. Until the statue is brought to the Old State Capitol at some unknown point in the future, it has been placed in storage in a Baton Rouge City Warehouse on Chippewa Street. The Henry Watkins Allen Camp's annual Lee-Jackson Banquet was again held this year in conjunction with the Brig. General Francis T. Nichols Camp #1362, and the Military Order of the Stars and Bars C.S.S. Arkansas Chapter 21. The event was once again held at Bergeron's Cajun Restaurant in Port Allen, LA on January 29, 2010. The event had approximately 50 attendees, and featured author and high school history teacher, Stuart Salling. Salling, who is the author of the book Louisianians in the Western Confederacy, gave a presentation about the Louisiana Brigade in the Shiloh Campaign. A reenactment of the seizing of the Federal Arsenal at Baton Rouge by Louisiana Militia forces and the subsequent signing of Louisiana's Ordinance of Secession by the Louisiana Legislature took place on January 15, 2011. 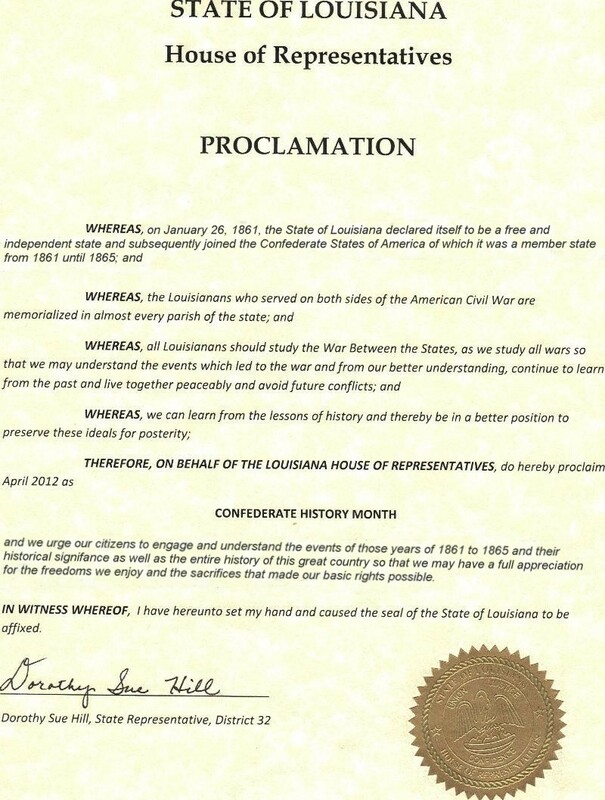 The event, which was sponsored by the Louisiana Division of the Sons of Confederate Veterans, was a part of the Sesquicentennial Anniversary commemorations of the beginning of the American Civil War. The events began in the morning near the New State Capitol, on the grounds of the Old Federal Arsenal. A tour group from France, as well as other spectators were treated to a living history presentation of the Arsenal being surrendered by Federal forces to militia troops commanded by then Louisiana Governor Thomas Overton Moore. The part of Governor Moore as played by one of his descendants, Mr. Ed Cailleteau who is an associate member of the Henry Watkins Allen Camp. After the surrender of the Arsenal, another reenactment took place in the Chamber of the House of Representatives at the Louisiana Old State Capitol. This event featured the unfurling of the then new, and short lived, Louisiana Secession flag, as well as the state's Ordinance of Secession being read aloud in French and English. The matter was discussed by delegates, voted upon, and then signed by the delegates. After the signing of the Ordinance, the group moved outside onto the steps of the building for a rifle salute by militia reenactors. Following this event, there was a memorial ceremony on the grounds of the Old State Capitol at the nearby grave/monument of Confederate Governor and Brigadier General Henry Watkins Allen.